Our economy has increasingly been financialized, and the result is a sluggish economy and stagnant wages. We need to decide whether to stop the cycle and save the economy at large, or to stay in thrall to our banks and bondholders by leaving the debt hangover from 2008 intact. Without a debt writedown the economy will continue to languish in debt deflation, and continue to polarize between creditors and debtors. This debt dynamic is in fact themajor explanation for why the U.S. and European economies are polarizing, not converging. As a statistical measure, financialization is the degree to which debt accounts for a rising proportion of income or the value of an asset, such as a company or piece of property. The ratio tends to rise until defaults lead to a crisis that wipes out the debt, converts it into equity, or transfers assets from defaulting debtors to creditors. As an economic process, financialization makes money through debt leverage — taking on debt to pay for things that will increase income or the value of assets — such as taking out a loan for education or a mortgage on a property to open a store. But instead of usingcredit to finance tangible industrial investment that expands production, banks have been lending to those who want to buy property already in place — mainly real estate, stocks and bonds already issued — and to corporate raiders –those who buy companies with high-interest bonds, raising debt/equity ratios. The effect often is to leave a bankrupt shell, or at least enabling the raider to threaten employees that bankruptcy would wipe out their pension funds or Employee Stock Ownership Plans if they do not agree to replace defined benefit pensions with defined contribution schemes that are much more risky. The dynamic is more extractive than productive. Corporate financial managers, for example, can raise their company’s stock price simply by buying back shares from investors — financing the move by borrowing money. But in addition to raising debt-to-equity ratios, these short-term tactics “bleed” companies, forcing them to cut back on research, development and projects that requirelong lead times to complete. Corporate managers are paid by how much they can raise their companies’ stock prices in the short run. When earnings are diverted to pay dividends or buy back shares, growth slows. But by that time, today’s manages will have taken their money and bonuses and run. On an economy-wide scale, rising debt can inflate prices for real estate, stocks or bonds on credit. Asset prices reflect whatever banks will lend against them, so easier credit terms (such as lower interest rates, lower down payments and more time to pay back loans) increase the asking prices of everything else. Banks have found the biggest loan markets (and targets) in mortgages for real estate, natural resources (oil and mining) and infrastructure monopolies. Most of the interest that banks receive from their lending thus is paid out of property rents and monopoly rents. To leave as much revenue as possible “free” to pay for more bank loans or stock issues, the financial sector defends tax benefits for these major customers, recognizing that whatever the tax collector leaves behind can come back to the banks in form of interest payments on further loans. These loans create debt-leveraged “capital” gains, which receive favorable tax treatment compared to profits and wage income. But the savings end up in the hands of banks rather than individuals who would spend that money back into the economy. At the household level, buying a homewith a 25-percent down payment leaves the home buyer with 75-percent equity. This was the normal rule of thumb for mortgage lending in the 1960s. If interest and loan payments absorb a quarter of the buyer’s overall income (a rule of thumb for bankers in the 1960s), then that person’s income is said to be 25 percent financialized. But today, homebuyers can put up as little as 3-percent down payment for a Bank of America mortgage guaranteed by the government agency Freddie Mac (and 3.5 percent for an FHA-insured mortgage), leaving homeowners with 97 percent financialization. Government-guaranteed home mortgages absorb a maximum 43 percent of the buyer’s income just to service their debt. 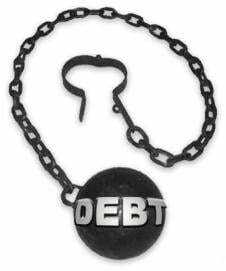 Student loans, auto loans, credit cards and other bank debt may absorb another 10 percent of the debtor’s income. This leaves only half of personal income available to spend on anything else one might need. Meanwhile,wage withholding for Social Security and Medicare (paying in advance to build up a fund that may not even exist to help them later in life) absorbs more than 15 percent of income, and other taxes (income taxes, property taxes and sales taxes) take up another 10 to 25 percent. In the end, the combination of financialization and the taxes shifted off the finance sector and onto individuals can eat away as much as 75 percent of a wage-earner’s income. The result is regressive taxes reducing purchasing power, on top of debt deflation as more income has to be paid tobanks and other creditors. As the “One Percent” of banks puts the “99 Percent” deeper into debt, financialization has become the major cause of increasing inequality of wealth and income. In due course, the amount of debt will exceed the economy’s ability to produce a large enough surplus to pay it back. This makes a financial breakdown inevitable. This financial dynamic always leads to a transfer of property from debtors to creditors, unless debts are forgiven or brought in line with the debtor’s ability to pay and the current market value of homes that are over-mortgaged and owe more debt than they are worth. In 2008, banks convinced governments to “solve” the debt problem by taking bad bank debt onto the public balance sheet and then bailing out the banks. Butwhile a government bailout or IMF loan may enable private creditors to jumpship, it shifts the burden onto the government – mainly to be borne by taxpayers. This requires governments to cut back spending, or to raise taxes to transfer income from taxpayers to bondholders. In the end, society must choose whether to save the economy at large, or to save bondholder and banking claims on the economy.